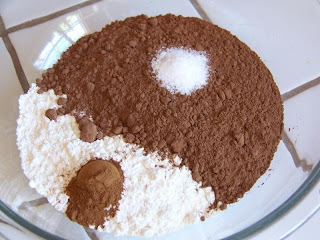 Last week Kimiko posted our favorite chocolate and vanilla cake recipes with tips for baking cakes. 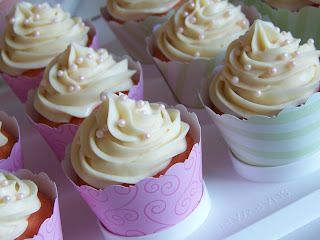 Today I’d like to give my tips for making cupcakes using the same recipe. Believe it or not, the cupcake wrappers you use can make a big difference in how they look when they are done. In my experience, the more ridges around the side, the better. Some that I’ve bought in the past that had fewer ridges folded in on themselves when I filled them. 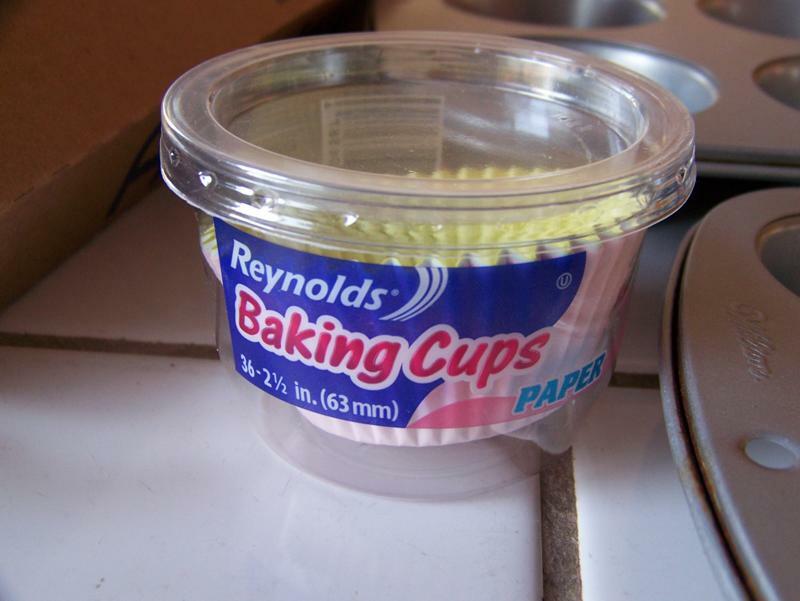 The Reynolds wrappers that can be found in any major grocery store work well. I buy boxes of 500 at a restaurant supply store because I make so many cupcakes. 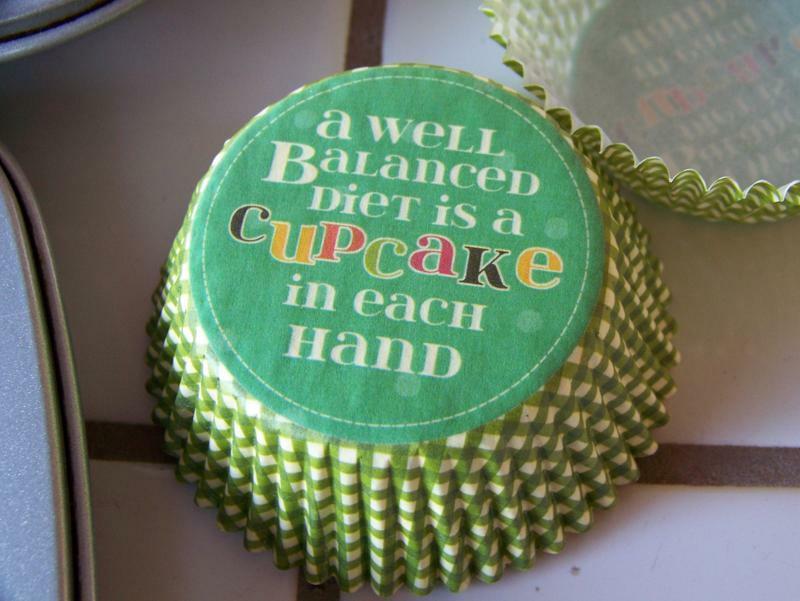 I also buy big packs of mini cupcake wrappers there. 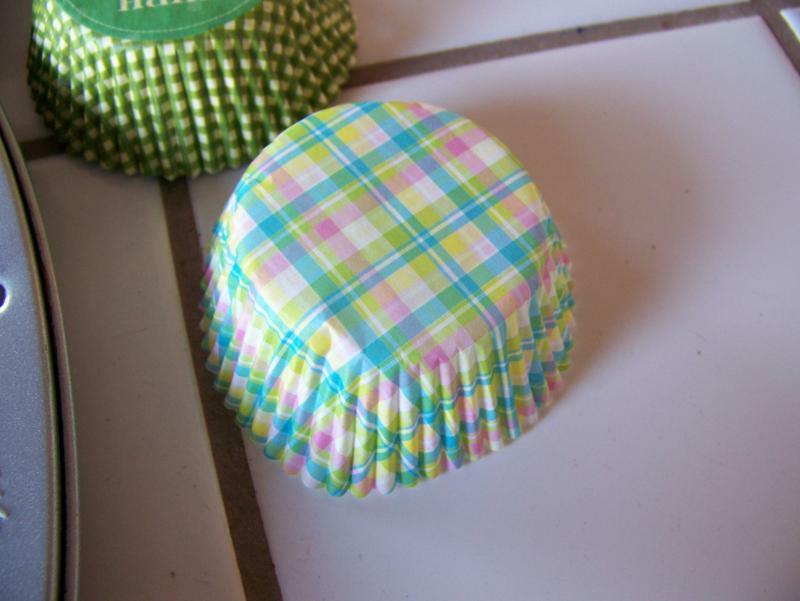 Michael’s has a huge selection of cupcake wrappers. Most of them are very cute, but buyers beware! 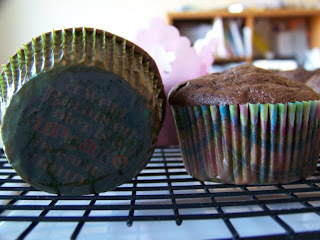 Even though they are marketed to be baked in, they don’t look so cute once they’ve soaked up the grease from the cake. 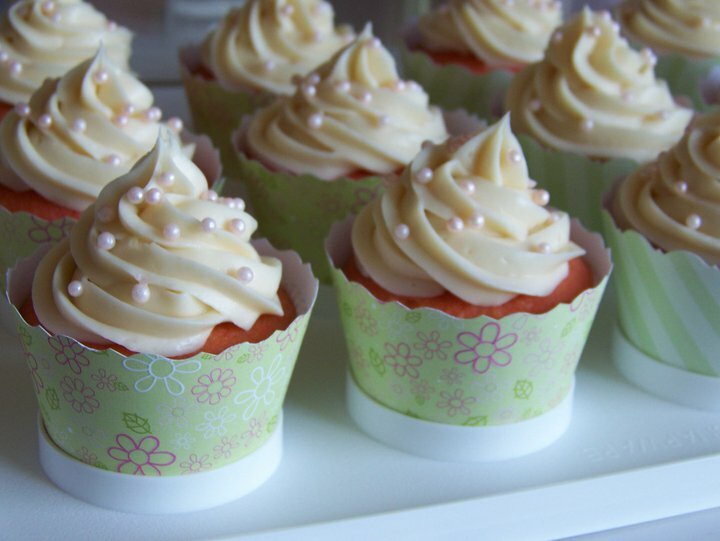 My suggestion is to bake in white wrappers and then drop them into the cute decorative ones before serving or displaying. 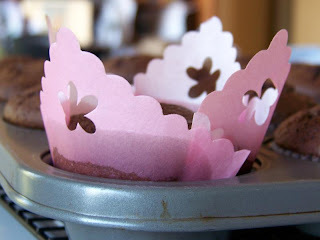 Cupcake sleeves are really popular now too. You can find them at Michael’s and online, but they can be quite pricey. I prefer to make them myself using the template you can find here. I simply use scrapbooking paper, craft scissors, and double-sided tape. When the paper is on sale, they only cost me about $0.20 each! the internet for about $1.50 each. I made these cupcake sleeves for about $0.20 each! To bake the cupcakes, I make the batter as directed. 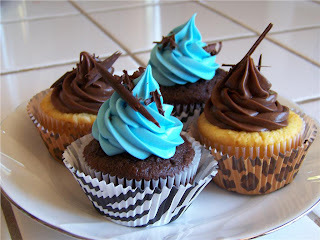 I usually include the chocolate chips, but sometimes I leave them out and fill the cupcakes instead (another post). 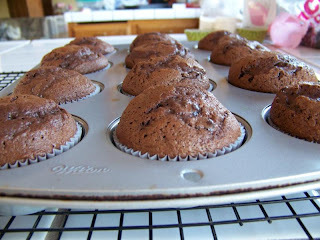 I just love the texture contrast of the chocolate chips! 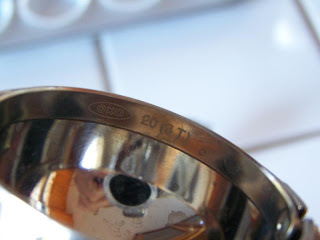 I use a number 20 disher (about 3 Tbsp.) to scoop the batter. 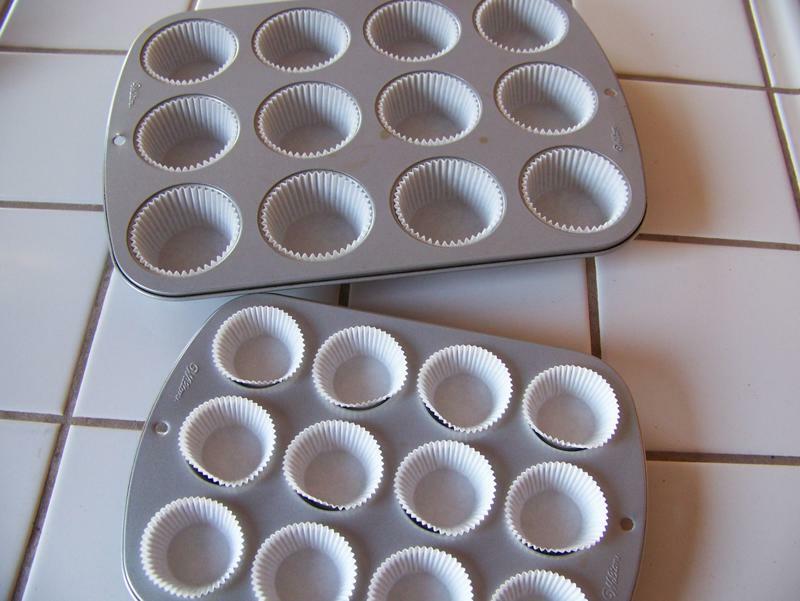 This ensures that all the cupcakes are the same size so they all bake evenly. Plus it is a lot faster and neater than using a spoon or other filling method. For mini cupcakes, I use a number 60 disher (about 1 Tbsp.). My #20 is made by OXO. I bake the cupcakes at 350° for 16 minutes for regular size and 11 minutes for minis. 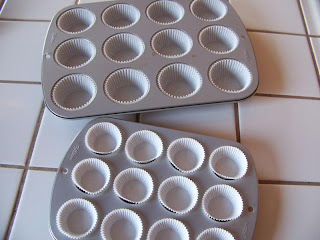 I make so many cupcakes that I know these times are perfect for my pans and ovens. 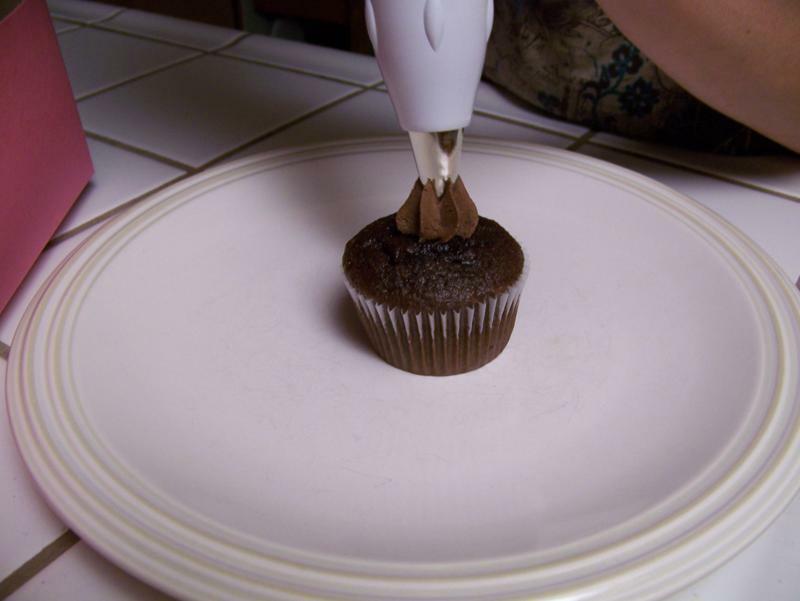 You would probably want to check the cupcakes a minute or two before to make sure they don’t get over done. 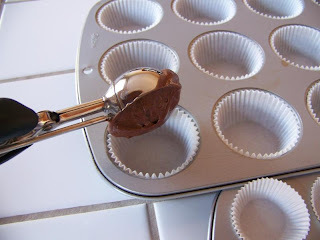 Keep in mind that if you test in a chocolate chip, the toothpick will come out with chocolate on it, but it shouldn’t have batter on it when done. 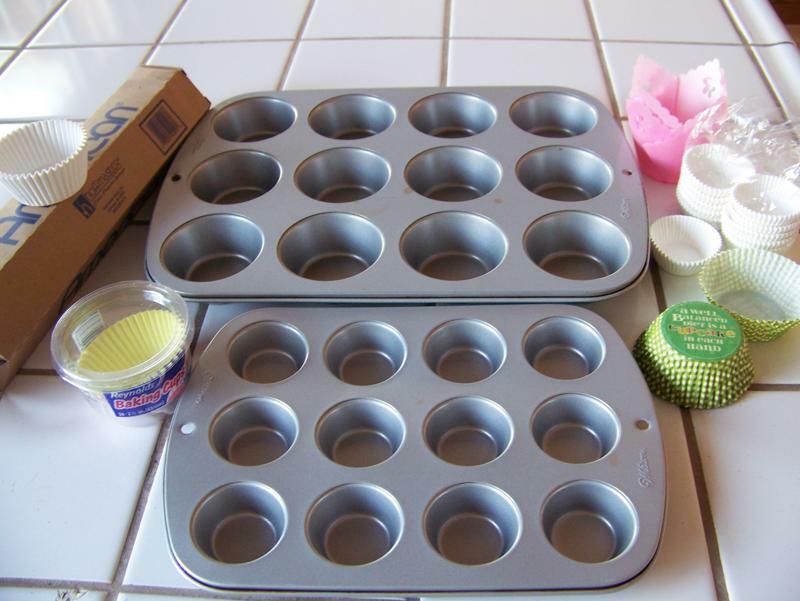 If you run out of batter without filling every hole, fill each empty one with a little water before baking. This prevents the pan from getting too hot and causing the cupcakes to burn. 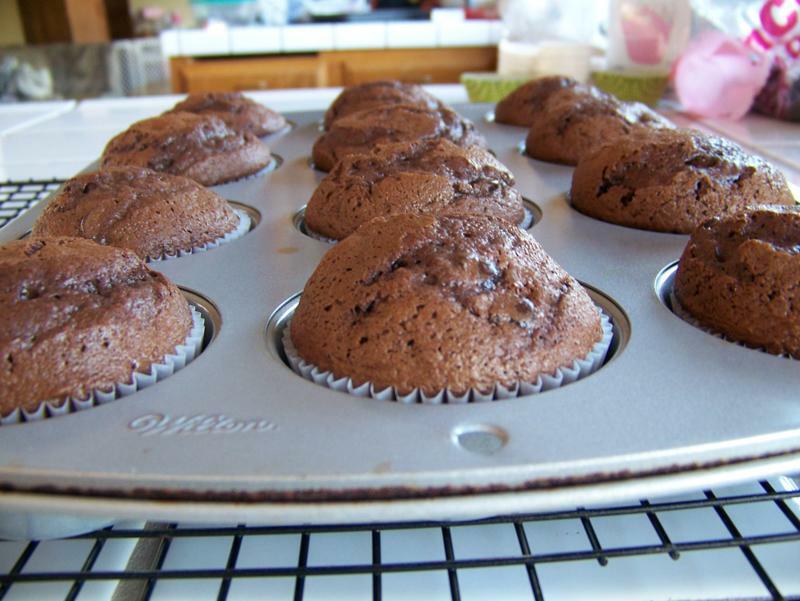 Cupcakes should be cooled completely on a wire rack before being frosted. 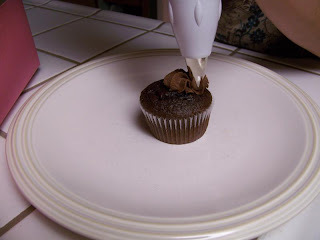 The fastest way to frost a lot of cupcakes is to pipe the frosting on. 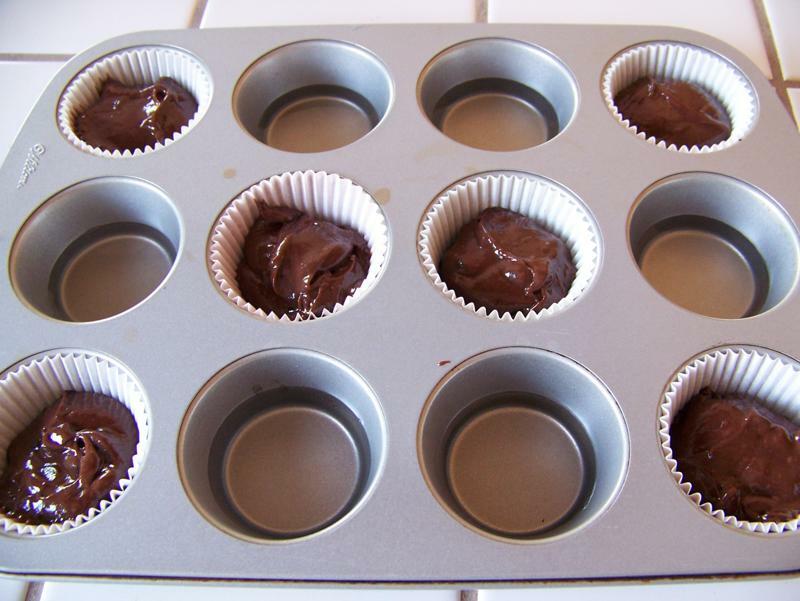 You can use any frosting you desire, whether homemade or store-bought. I use an 18” piping bag with a Wilton 1M tip for regular cupcakes. For mini cupcakes, I use a Wilton 21 or 32 tip. All these supplies are available at Michael’s. To fill your piping bag, fold down the top to keep it from getting messy. 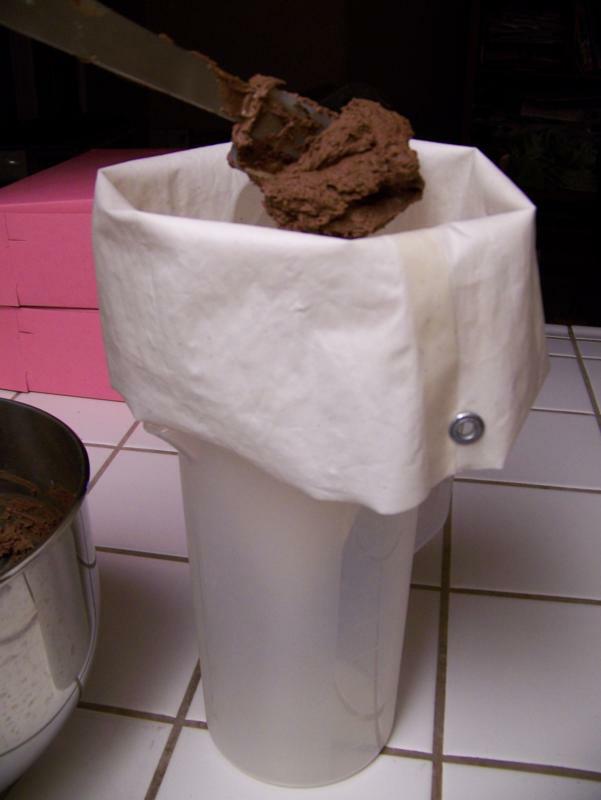 Place the bag in a pitcher or large glass. Spoon the frosting in, leaving a few inches at the top. 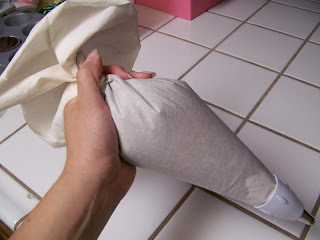 Fold the top back up and twist. 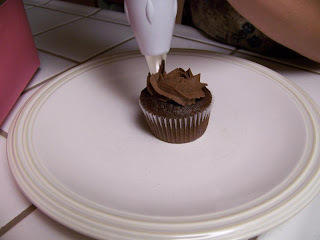 The key to smooth piping, whether swirls on cupcakes or delicate lacework on a cake, is to squeeze the bag at the top with your dominant hand while using your weak hand as a guide at the bottom. Kids especially always want to give the bag a big squeeze with both hands, particularly at the bottom. With cupcakes, I always start in the middle. This gives me something to build the swirl on. 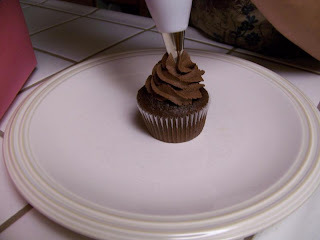 Once the cupcakes are frosted, sprinkles or chocolate shavings are a great way to dress them up. I'm sorry for the amount of posts that have been about sweets recently. 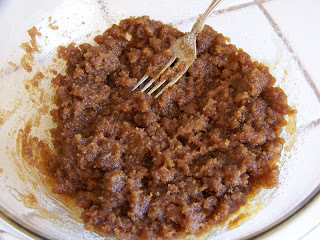 As Sumiko said on Friday, we're quite busy this week since our families are together, so our posts are limited to recipes we already have ready to go. Therefore, you're left with these not-so-nutritional-but-still-oh-so-yummy recipes. Which leads to today's recipe: candied almonds. Almonds aren't necessarily cheap, but I like to keep them on hand. 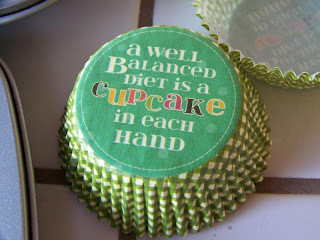 They make great snacks (in moderation, of course)! I usually buy them at Sam's Club (the unsalted ones). I've found they're typically cheaper there than anywhere else, even when they're on sale elsewhere. Be careful, though. These candied almonds are addicting! In a medium saucepan, combine water, sugar, cinnamon, and vanilla. 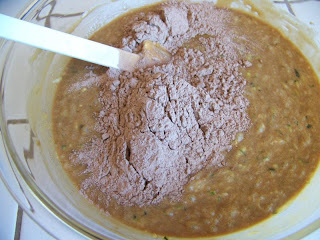 Add almonds; stir until ALL the liquid is gone and the almonds are coated with the sugar mixture. 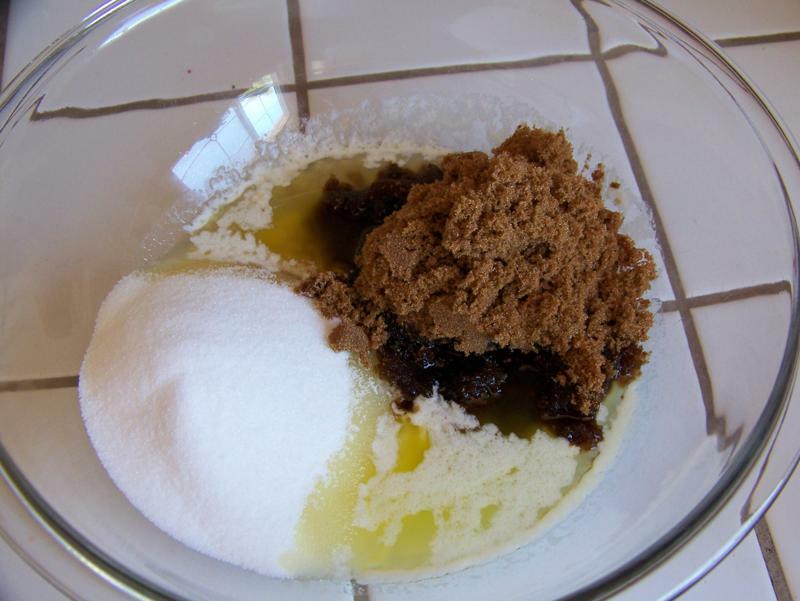 Right after the almonds were added to the sugar mixture. The sugar is starting to caramelize a bit. 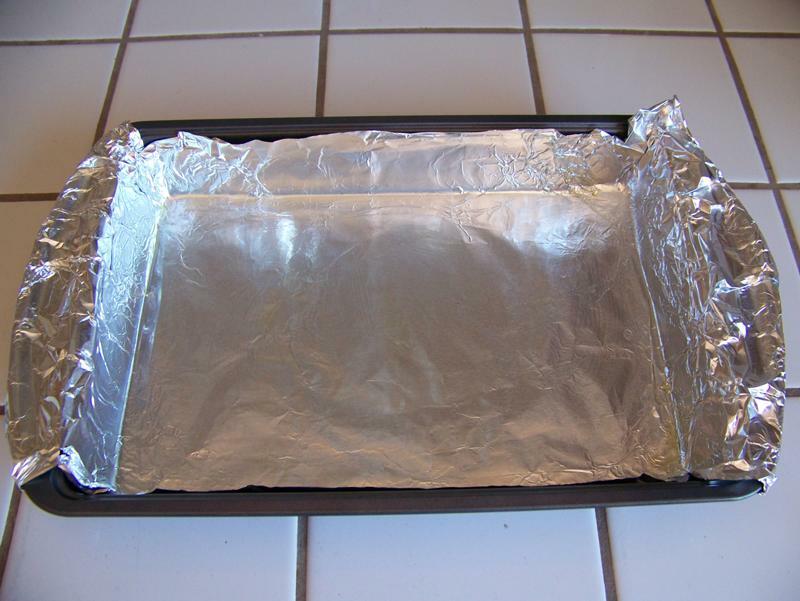 Remove from heat and spread almonds on prepared baking sheet. Allow to cool 15 minutes. 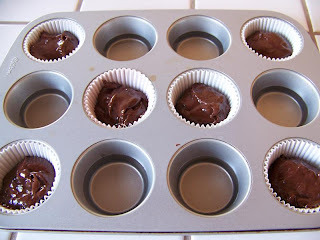 Store leftover almonds in an air tight container. It’s zucchini season! And we all know that means trying to find as many ways as possible to get rid of it. (See summer harvest pasta.) If you've ever grown zucchini, you know how it goes. You plant one seed and end up with a fridge full of the stuff. You give it away to your friends and neighbors until they are giving it away to their friends. I don’t actually plant zucchini in my garden, so I am the grateful recipient of my neighbor Jerry’s zucchini. A few weeks ago, one of my college roommates mentioned that she was making zucchini chocolate cake so I asked for the recipe. When she sent it to me, it was on a document with a zucchini brownie recipe that she said was no good, but challenged me to fix it. 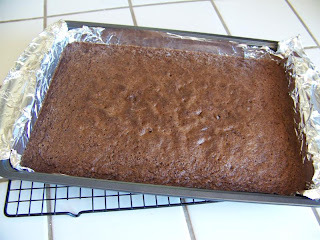 Well, after a few alterations and a batch of brownies in the garbage can, I scrapped the recipe and went to my go-to chocolate brownie recipe. A few changes and voila—zucchini brownies! Despite how weird it sounds, they are actually very good. Most people can’t believe there is zucchini in them. 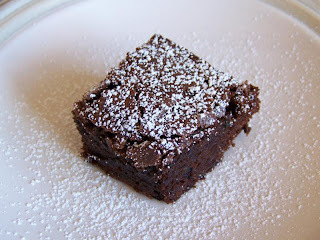 I just want to make one thing clear (for the kids, of course): zucchini brownies are not a substitute for veggies. Consider the zucchini bonus nutrition. 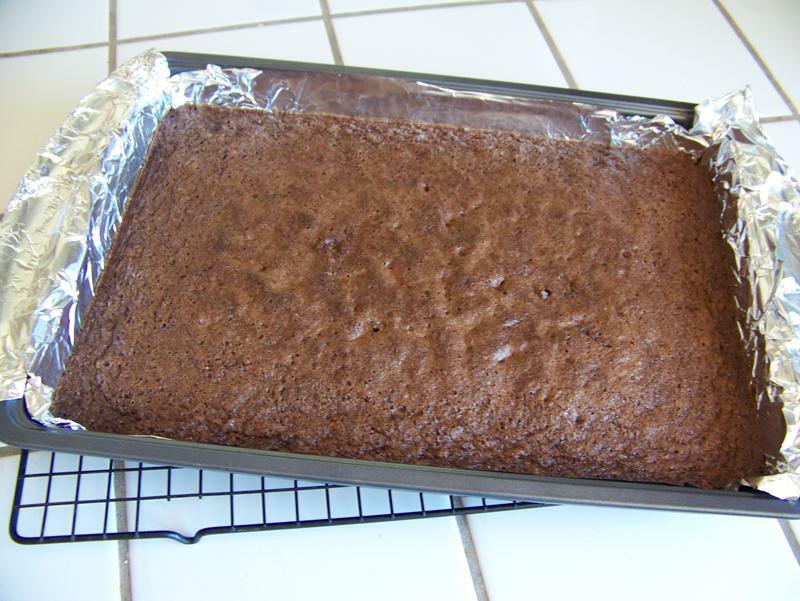 I put anywhere from two to three cups of zucchini in my brownies. At two cups per batch, there is only one tablespoon of zucchini per brownie if you cut them into 32 pieces. 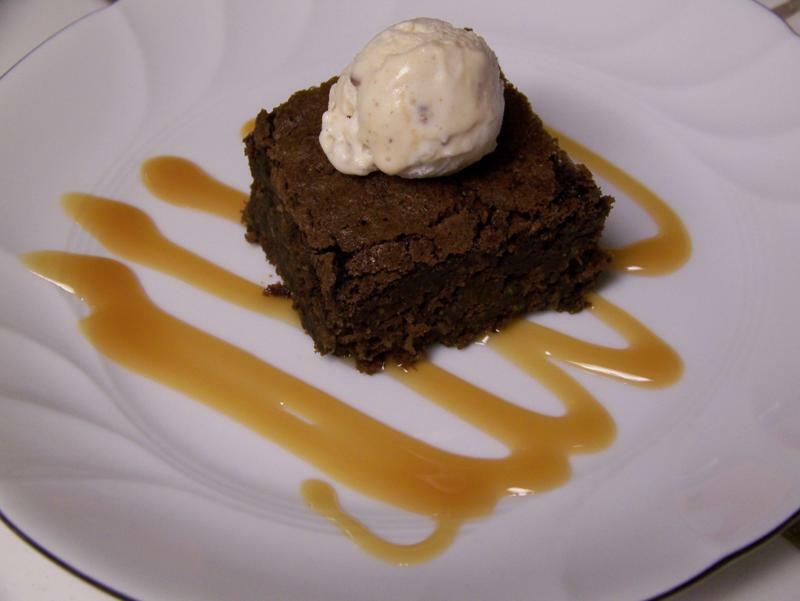 To get a whole serving of vegetables, you’d have to eat 16 brownies. 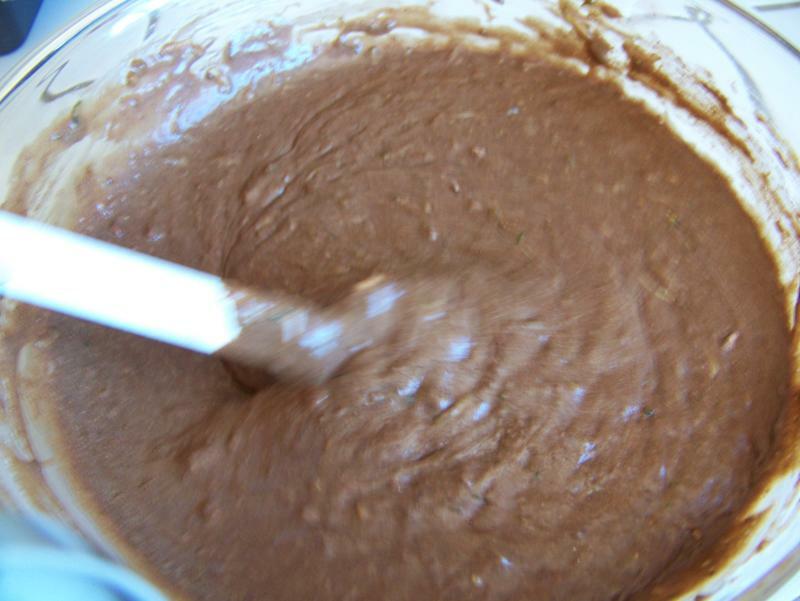 One key step in adding zucchini to brownies is to remove some of the water from it. I usually use my food processor to shred the zucchini, but a cheese grater will do. Either way, after it is shredded, dump it out onto a tea towel. 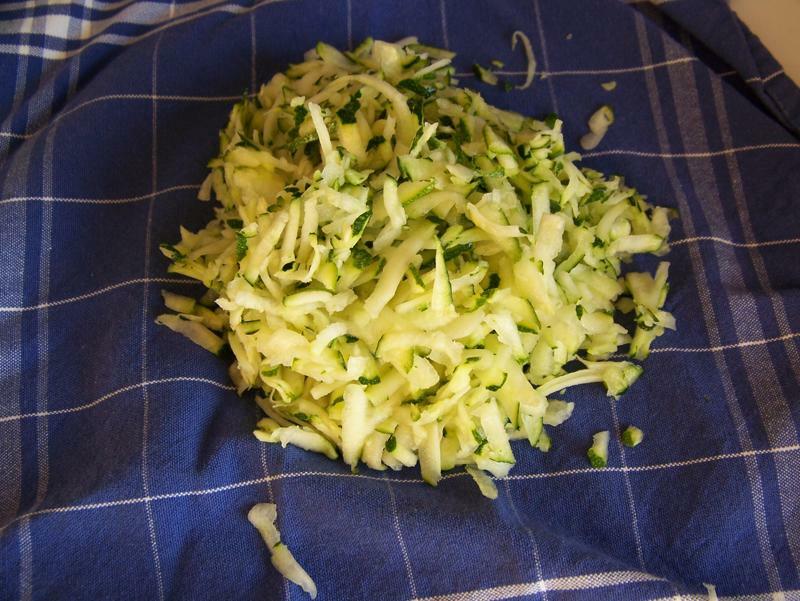 Bring the corners together and twist, squeezing as much water out of the zucchini as you can. You will notice that the water is green. Unfortunately, that is some of the nutrients going down the drain, another reason why you can’t count after-lunch brownie as a serving of veggies. To make the process easier, I shred and squeeze a bunch of zucchini at one time and store it in a container in the fridge for up to a week. 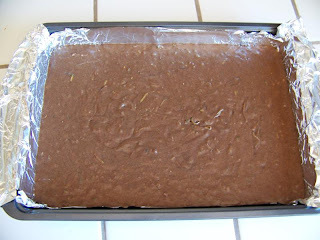 That way I can quickly make a batch of zucchini brownies, cake, or bread. Preheat oven to 350°. Line 9”X13” pan with foil; spray or rub with oil and set aside. 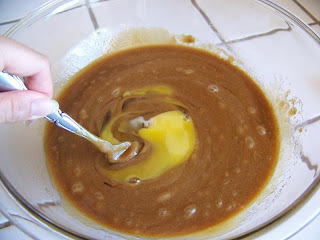 In large bowl, stir together melted butter, sugar, and brown sugar until thoroughly combined. Mix in eggs one at a time, stirring in completely before adding the next egg. 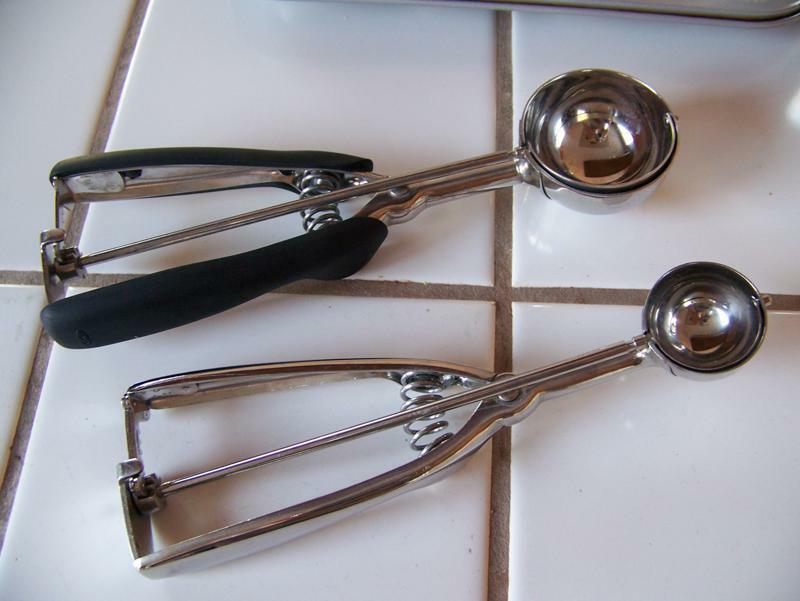 ...and to help break up the eggs. 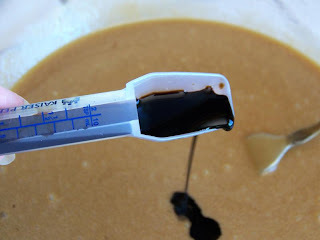 Add vanilla or maple flavoring. 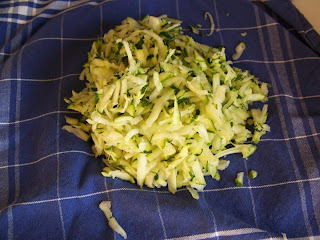 Stir in zucchini. a whole drawer full of them. In a medium bowl, whisk or sift together flour, cocoa, salt, and cinnamon. 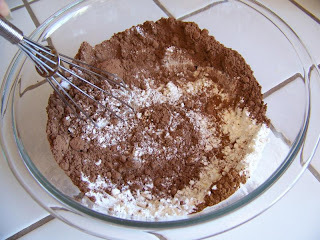 Gradually add dry ingredients to wet ingredients in three additions, stirring completely each time. 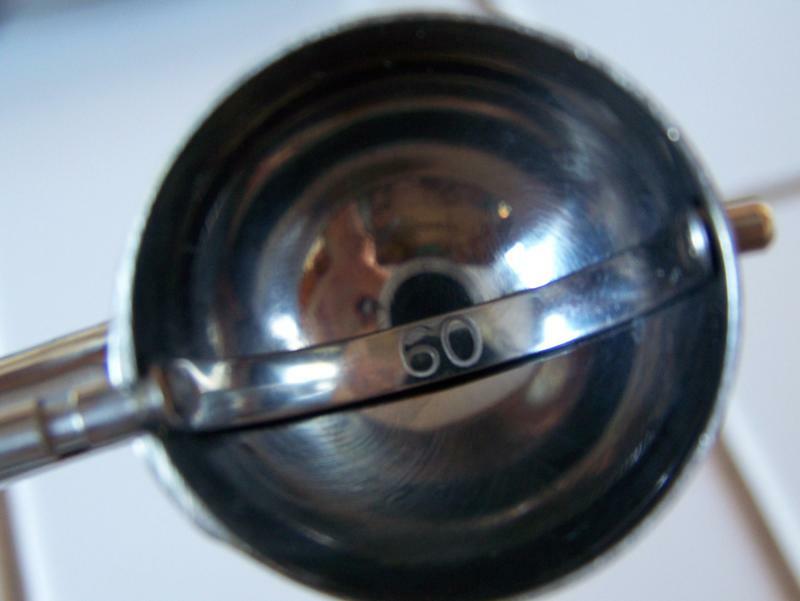 Bake 35-40 minutes or until toothpick comes out clean. Transfer to wire rack to cool. 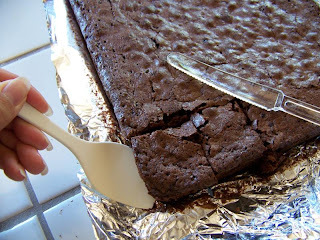 Use foil to lift brownies out of pan. 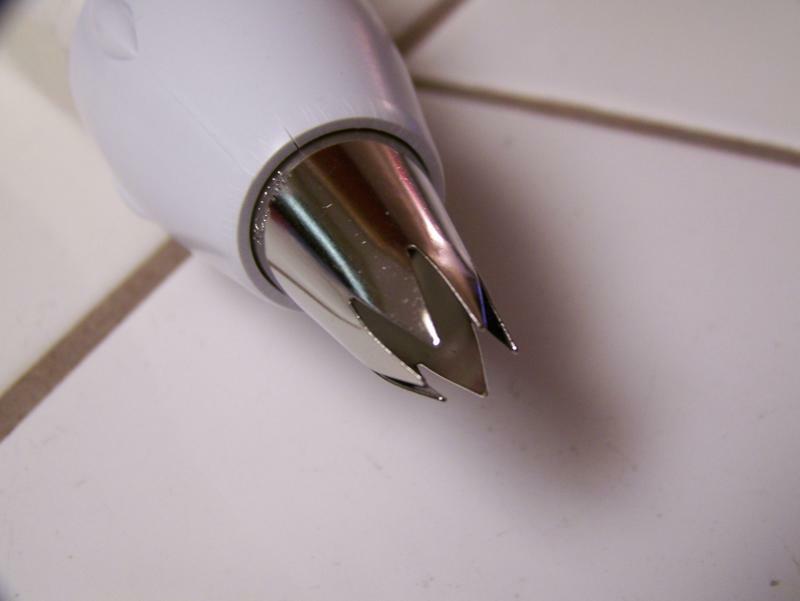 Cut into 32 pieces, using plastic knife. 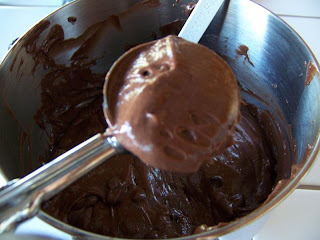 so the brownies come out looking neater. We're Just Having Too Much Fun!